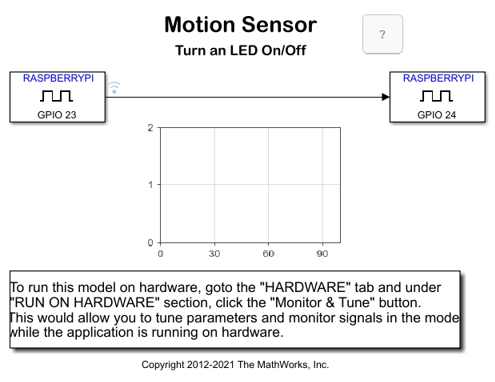 This example shows how to use Raspberry Pi® hardware to interface to a motion sensor and control an external LED. In this example you will learn how to create a Simulink® model that reads the output of a motion sensor and performs a series of actions based on the detected motion activity. For this example, we will be using a Passive Infra-Red (PIR) motion sensor from Parallax® Inc. The PIR Sensor is a pyroelectric device that measures changes in infrared heat levels emitted by surrounding objects. When an object, such as a person, passes in front of the PIR sensor, outputs a logic HIGH on its output pin. If no motion is detected, the sensor sets the output pin to logic LOW. In the circuit schematic above, an LED has been connected to a GPIO pin. This LED will turn on whenever motion is detected. Note that the forward voltage of the LED used must be smaller than 3.3 Volts. We recommend using a 1.8mm red LED. 1. Interface the PIR motion sensor to the Raspberry Pi hardware as shown in the circuit diagram above. 2. Connect a red LED to the indicated GPIO pin of the Raspberry Pi hardware as shown in the circuit diagram above. NOTE If you do not have the PIR motion sensor available, you can substitute a simple push button, as shown in the simplified circuit diagram below. 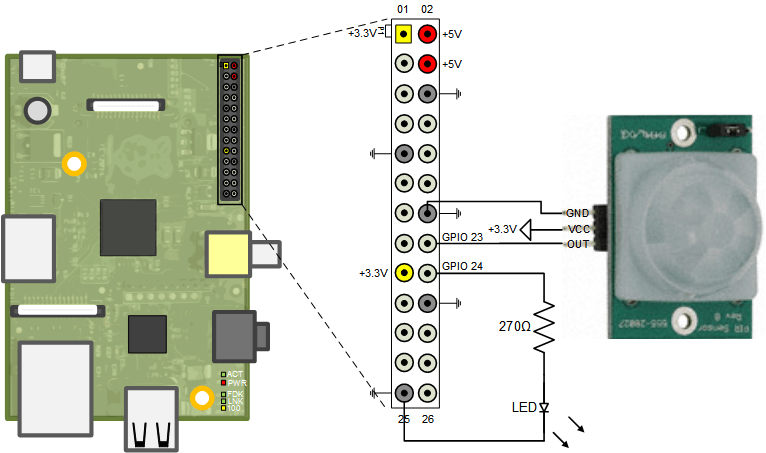 In this task you will turn on the LED connected to the board when motion is detected by the PIR sensor. 1. Open the Motion Sensor (Turn on LED) model. The GPIO Read block reads the output of the motion sensor every 0.1 second. The value read from the motion sensor is written back to the GPIO pin supplying power to the LED. The Dashboard Scope block displays the behavior of the connected signals during simulation. Simulink displays a logged signal indicator indicating that the signal connecting the GPIO Read and the GPIO Write block is marked for logging. Marking the signals for logging enables you to monitor the effects of parameter tuning during simulation. For information on logging signals, see Mark a Signal for Logging (Simulink). 3. On the Simulink model toolbar, set Simulation mode to External. 4. Click Simulation > Model Configuration Parameters to open the Configuration Parameters dialog box. 5. Browse to Hardware Implementation > Target hardware resources > External Mode, and set the Communication Interface parameter to XCP on TCP/IP. 6. On the model toolbar, click the Run button. During simulation, the Dashboard Scope block displays output of the motion sensor. When new simulation data becomes available in Simulation Data Inspector(SDI), the Simulation Data Inspector button appears highlighted. 7. (Optional) You can click the Simulation Data Inspector button to inspect and compare data from multiple simulations for validating model designs. For more information on SDI, see Inspect and Analyze Simulation Results (Simulink). 8. Click Stop button to stop the model. The firmware available for Raspberry Pi hardware includes eSpeak text to speech synthesizer. In this task you will use the eSpeak Linux package to output "Motion Detected" when sensor OUT pin goes high. 1. If you are using the analog audio output of the Raspberry Pi board, Connect a pair of headphones or speakers to the analog audio output jack. If you connected your Raspberry Pi to an HDMI monitor or TV, you will hear the audio from the speakers of your display device. 2. Open the Motion Sensor (Text to Speech) model. 3. In your Simulink model, make sure that the Simulation mode on the toolbar is set to External. Then, click the Run button on the toolbar to run the model on the Raspberry Pi hardware. 4. When the model starts running you will hear your Raspberry Pi hardware speak "Motion Detected" whenever the PIR sensor detects motion. 5. Click Stop button to stop the model. In this task you will create a Simulink model that captures a picture and saves it on board when motion is detected. 1. Connect a compatible USB camera to the Raspberry Pi hardware. 2. Open the Motion Sensor Camera model. Use LED block to turn on an on-board LED when motion is detected. Use Counter Limited block from Simulink library instead of Counter Free-Running to limit the number of image files to 255, for example. GPIO Read block lets you read digital logic levels output by an external device. GPIO Write block lets you output logic high or low values to control external devices. LED block lets you to turn an on-board LED on or off. eSpeak Text to Speech block lets you synthesize speech.